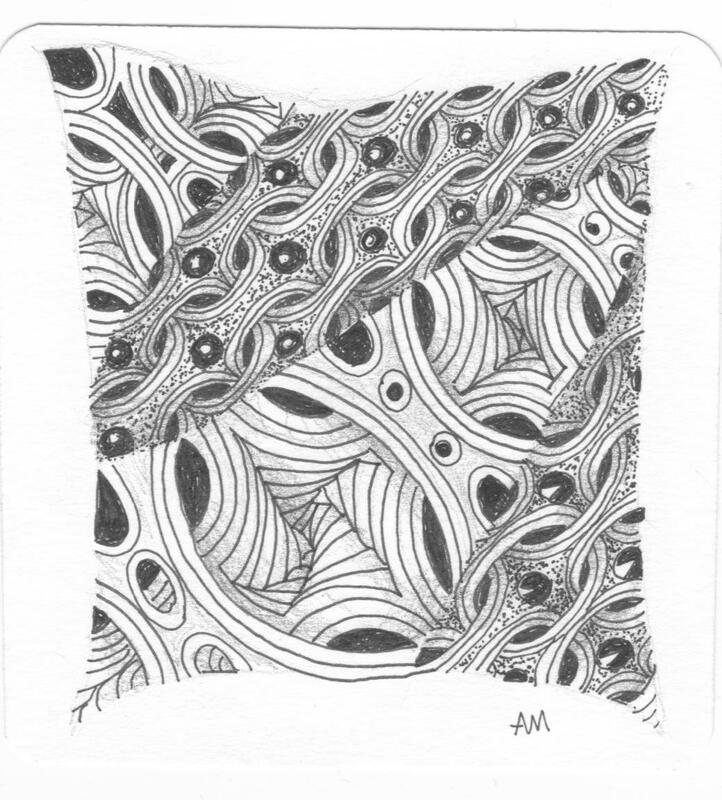 This week Laura has challenged us to create a monotangle of Mi2. I have been using this tangle a bit so was really pleased to do this challenge!! I had previously completed this challenge in colour wash, so will post that one again, as I think its better than the black and white one. A few more colour washes!! I found these which I had done when away in WA. You'll be tired of seeing them!! warned you they're addictive. 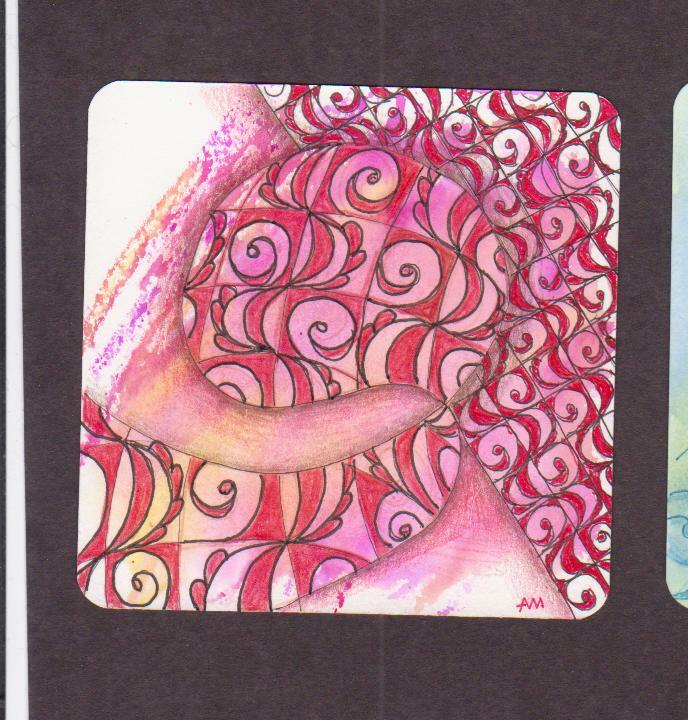 Plus a little bookmark I did exploring pink and brown. Another new tangle I have yet to post here Diamond Flowers. Today I had my tangle ladies for our usual fortnightly afternoon fun together. We haven't met for quite a while as I was in WA and then it was 2 weeks school holidays. They showed me what they had been up to in the meantime. I asked their permission to show their work . Helen is really into quirky pictures, they are so cute. Any water soluble marker should work. You will also need a perspex or plastic sheet, a spray bottle for water and a rag to wipe clean the plastic. 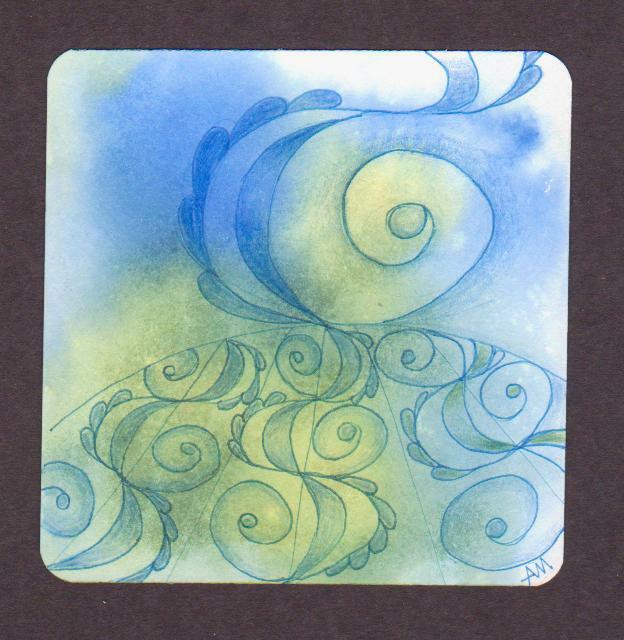 I use watercolour paper or /and tiles. Carefully lift off. They do look better when dry. On the right is the first "Print", on the left another print over the same area. A holiday class who had lots of fun! Warning! This can be addictive. Practice will perfect your technique too. Enjoy! As you know I am rather addicted to colour wash at the moment. Well I had an experiment with using inks this week. Yay! They are soooooo bright! I may have used too much ink, but its a start. 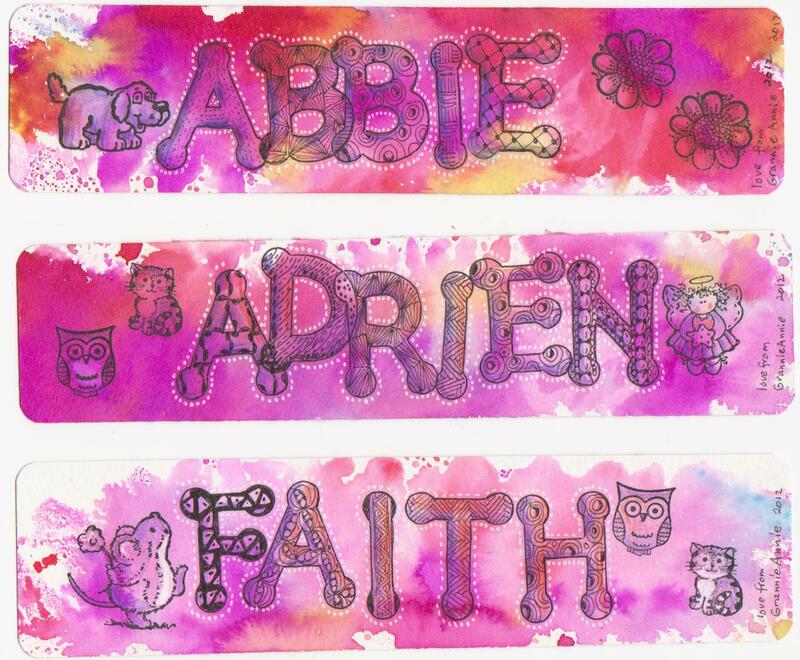 Once dry I then stamped them at the ends, followed by stencil letters which I tangled, then shaded in a purple and brown. I placed a little message on the back too. Wacha reckon? On an A4 sheet of perspex I place 3-4 drops of ink in two colours, swirl them around a little, then lightly spray with water. For these bookmarks I used 300gsm watercolour paper which I pressed onto the ink, then carefully lift off and let dry. The white dots are using a gel pen. Have a go, its great fun. Let me know if you need pictures to show the method!! 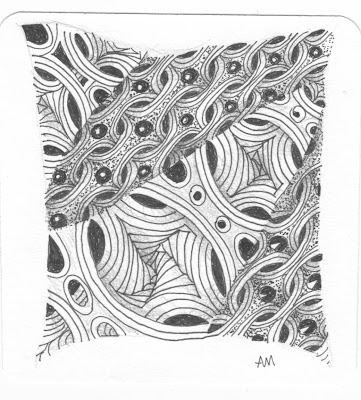 Most Fascinating Blog (Zentangle teacher category) search is now on. If you have found my website interesting and helpful, then vote for yours truly ie "preciousworker.blogspot.com". Select the TO VOTE link at the right under "Links to other sites". (Selecting the icon doesnt work - never did work out why not!!). 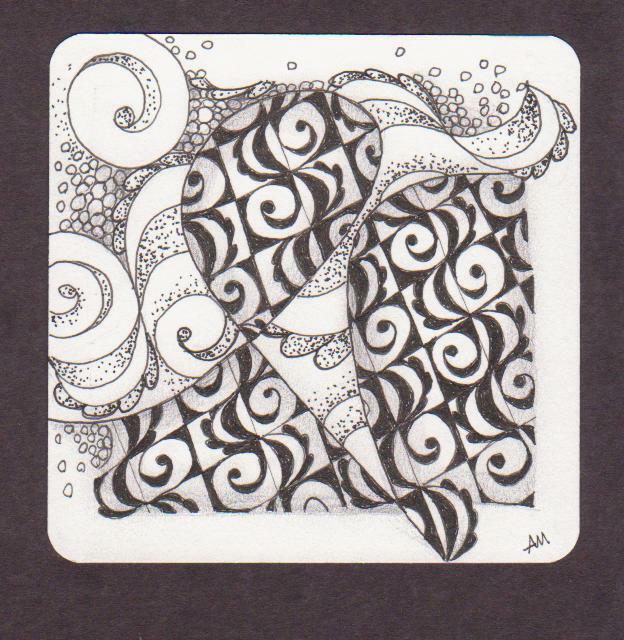 Scroll down to zentangle category and select the "29 comments" .The 29 blogs will open as a list. Place cursor over the +1 and click. Thanks sooooooooooooooooooooooooo much for your vote. Labels: voting for most fascinating blog. Since I saw the first camelia blooming on our bush yesterday, I decided to call this tangle after it. 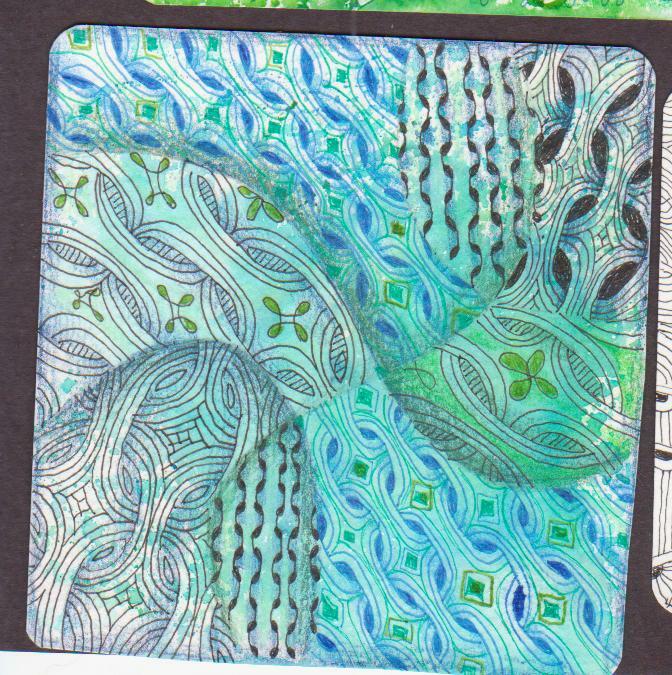 Whilst this design may seem a bit complex, it is a nice flowing one to get lost in. It lends itself to variations, eg. leave out the grid and you have a nice line of movement. As you can see, I'm still going with my colour wash back grounds..so many of them to put tangles on!! 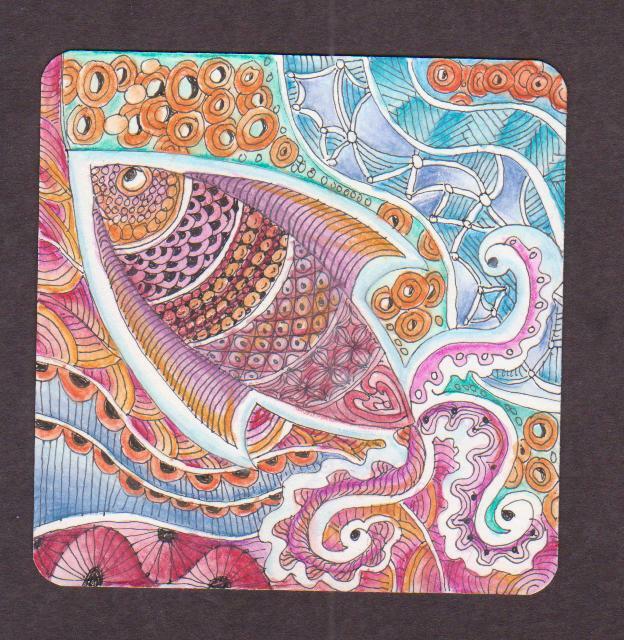 I actually completed the watecolour fish too.. If there's "anyone out there" who is IT savvy, I still can't get my nomination icon to work. I have googled how to's and followed their instructions, to no avail. You can email me with some instructions if you can help. 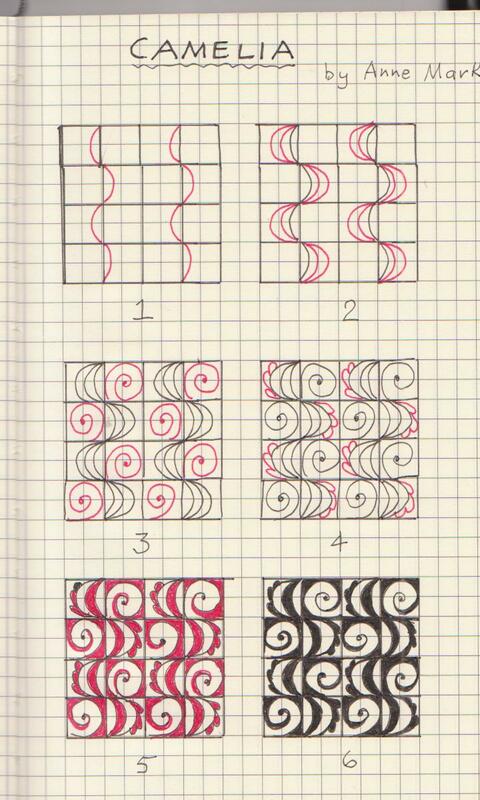 I also can't add tangle patterns icon either, so I must be not doing something!! I enjoyed this challenge, seeing where it would take me! 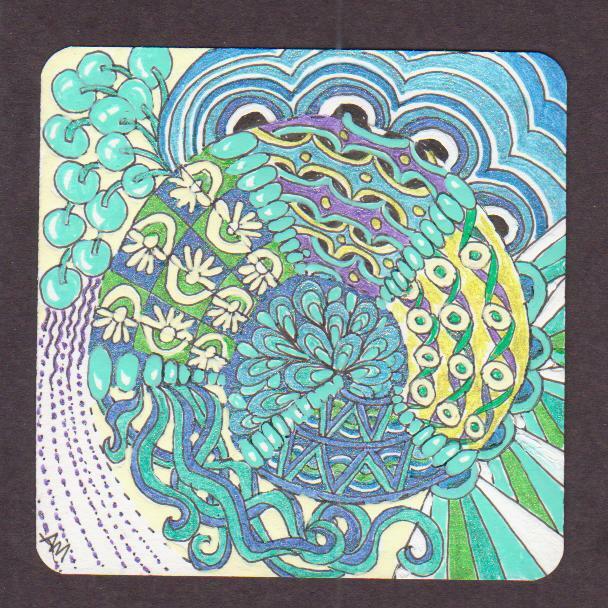 I used a colour wash background and a few coloured pens and white, then shaded with pencil. The challenge was to use the tangle 'auraknot'. For the second sample I used Tombow markers﻿, direct (straight onto paper) and indirect colouring. The latter requires a blender which picks up colour laid on another surface. This enables you vary the depth of colour and blend colours into each other. I apologise that this one isnt finished﻿, but the fish will give some indication of the effect of using watercolour pencils (Derwents). I find with these that you have a better control over what you do, and that they are great for fine detail work. 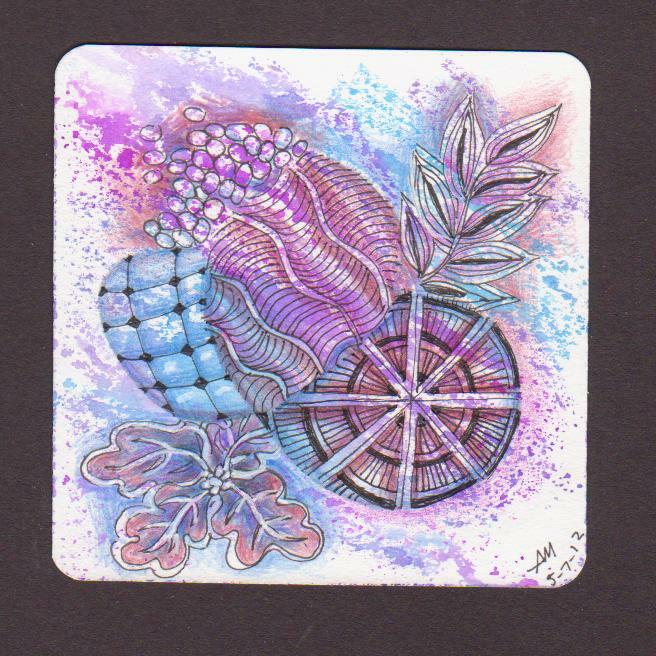 This tile is a monotangle of Mi2, created on colourwash background, using a black 01 Sakura micron and coloured with Verithin pencils. ﻿Here I used a 005 Micron black on colour wash with coloured pencils. The remainder of samples show the use of colour wash backgrounds with a stamp (great for children), coloured microns and coloured pencils. For two I employed a white pen to highlight. Wow! I was so excited to receive a nomination for fascinating blog, what an honour. I shall have to catch up seriously now. I noticed I havent blogged for a month, dear , dear. I had a great two weeks in WA with my six grandchildren. Actually another was born to the same family last night!! This time I stayed overnight in Perth rather than do the trip in one go. After a four and a half hour flight which follows an hour and a half train trip, there is a three to four hour drive north from Perth to where the family lives. Breaking the journey is certainly a better way to travel. 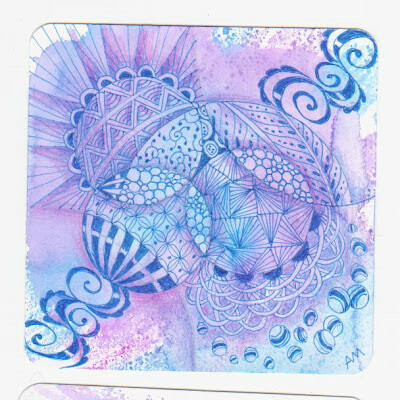 Whilst away I shared with some friends about Zentangle, they were most interested and wanted to know lots about it. 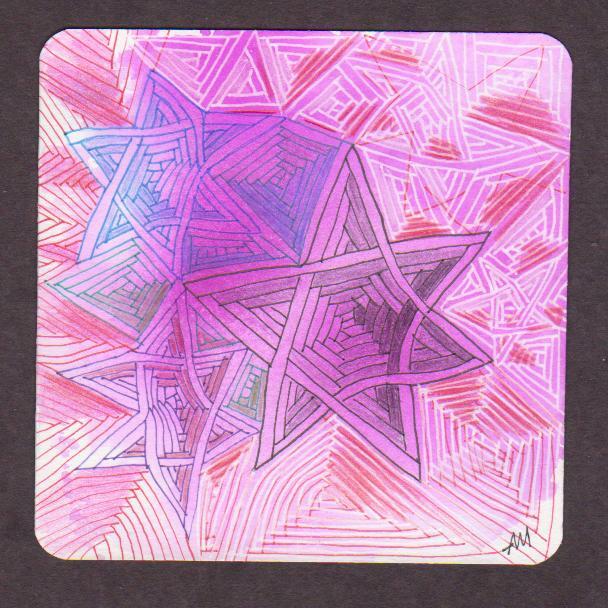 Of course my littlies also love tangle patterns and avidly drew while I was there. I was delighted with this one! Adrien(9), loved to use colour. Here we have the whole tribe! 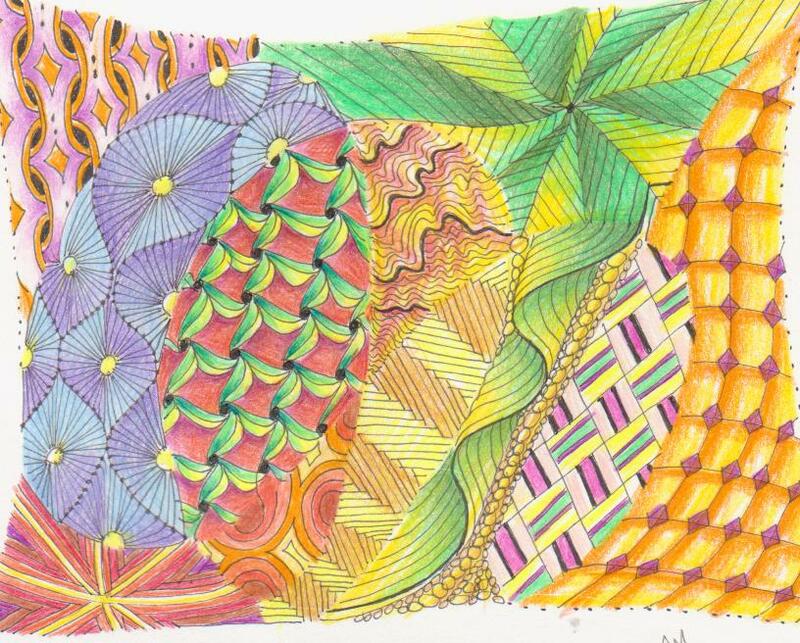 I like the way the patterns contrast with the colour, which was applied with coloured pencils. ﻿Life has been hectic despite being holidays. I guess its a time when people catch up with each other. 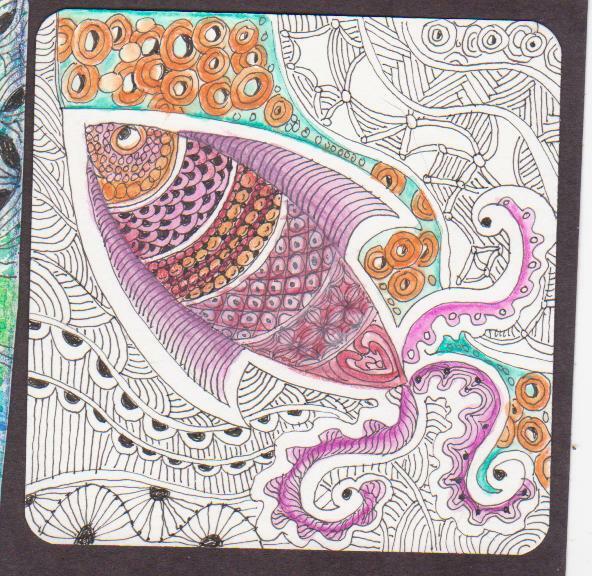 Nevertheless I managed to find some time to play around with different ways to colour my tangles. For this I used Prismacolour Verithin pencils. I found they blended quite well, and were good for fine detail. I used a colour wash background for this one. I did quite a few with grandies..they LOVE the technique. Used coloured pencils for shading with some wuite gel pen for highlights. 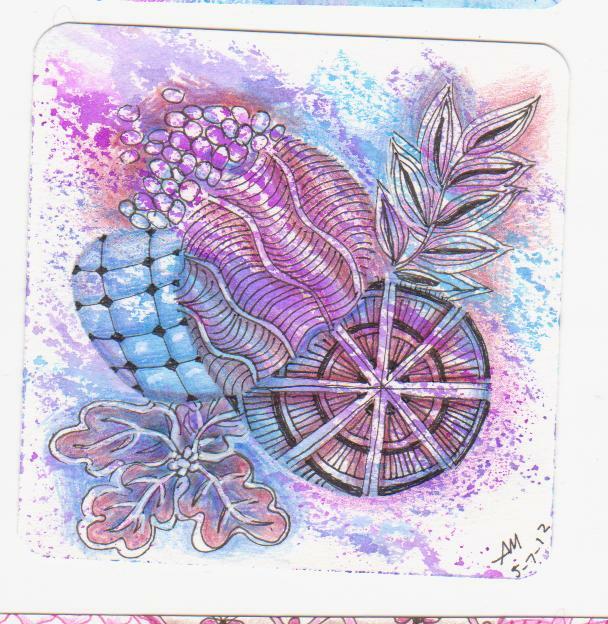 Labels: colour wash, holidays, Verithin colour pencils.